Many general dentists are now performing several different types of orthodontic care, so why do you need an orthodontist in Raleigh or Cary? Well, there are many reasons. If you think about it in terms of your overall health, you wouldn’t go to your primary care doctor for surgery, you would go to a specialist, a surgeon. An orthodontist is a specialty dentist, much in the same way a surgeon is a specialty doctor. General dentists specialize in diagnosing, preventing, and treating dental disease. They complete four years of dental school and often go into practice after graduation. They focus on the entire oral cavity and its health. Orthodontists are specialists in facial growth, dental development, and occlusion (how your teeth meet together). They also specialize in tooth and jaw alignment and solely perform orthodontic work. While a general dental practitioner may provide orthodontic treatment, they have not completed the additional two to three years of education and training to specialize in orthodontics. Often, orthodontic treatment can prevent many other problems. Crooked and crowded teeth are hard to clean and can lead to cavities and periodontal disease (gum disease). Malocclusion, or misaligned teeth when the jaw is closed, can cause tooth enamel (the outside, hard covering of teeth) to wear abnormally, as well as causing difficulty in speaking, chewing, or swallowing. Malocclusion can also cause excess stress on the supporting bone and gum tissue, as well as temporomandibular joint (jaw) pain. Because an orthodontist specializes in straightening the teeth and aligning them correctly, many of these issues can be avoided with orthodontic care. Early orthodontic intervention is also important at Walton and Maready. An orthodontist can evaluate a young child’s developing teeth and jaws through X-rays and determine if there are any issues before they become visible to the eye. This will help you plan for your child’s needs, as well as the best timeline for correcting any issues. The goal of this interceptive treatment is to identify the problems, eliminate the causes, guide the growth of facial and jaw bones, and provide adequate space for incoming permanent teeth. Another bonus of taking a younger child to an orthodontist is that the staff are familiar with young children and their fears surrounding braces. They can generally comfort a child who is nervous about what is about to happen. 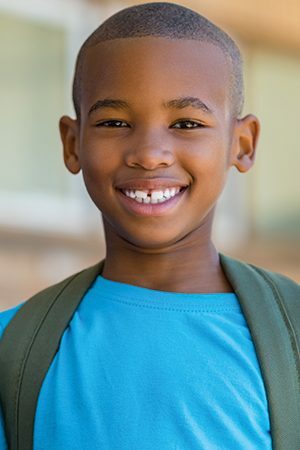 Additionally, at Walton and Maready, we always provide free consultations, and we share our findings with your child’s general dentist to help you stay on top of your child’s developing smile. An orthodontist will be knowledgeable about all of the new technologies and products available, as well as being experts in applying these technologies, to make your treatment shorter and more affordable.